If you had to pick two of these words to describe your friend, which ones would they be? This was what I asked a number of teenagers earlier this week when I spent a few hours helping at Sanctum which is a project that CYO runs in schools in the Colchester area. Sanctum involves a room full of activities that are designed to give young people the opportunity to pause and in a creative way, to reflect on life and faith for themselves. 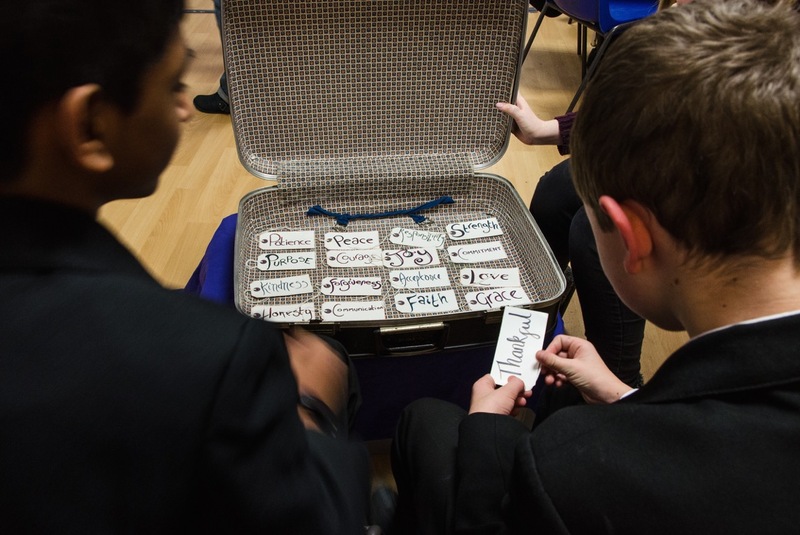 The activity that I was responsible for involved a suitcase which contained words written on luggage labels. The pupils had to pick two of the words each and then explain why they had picked them to describe their friend. It was a real privilege being a part of the conversations that followed and in almost every instance when I asked the person whether they were surprised to be described in that way, they said yes. Most of the participants had a hard time accepting positive comments and that made me glad that they had had the opportunity to hear and receive them. The word that people seemed to be the most surprised about was ‘inspirational’ and the word that was probably selected the most was, can you guess? That’s right, it was inspirational. We can all feel very ordinary, but to our friends, our time, patience and commitment to them can mean the world. If you are committed to your friend then there is a good chance that they find you inspirational! At the end of my short time running this activity I was left wondering why we don’t encourage each other like this more? The people taking part were friends but it seemed like they had never said to one another, ‘I find you trustworthy, honest, kind, brave, strong, etc’. It’s sad if we find it difficult to talk about what really matters. One of the other volunteers confessed to me later that she would struggle to run this activity because listening to the young people talking always makes her want to cry. It is a wonderful thing to hear people talking to one another so positively. Is there someone you could encourage by telling them what they mean to you? This entry was posted in encouragement, Everyone is valuable, Faith, Life experiences and tagged building one another up, CYO Colchester, encourage one another, life experiences, prayer spaces in schools, sanctum cyo, who can you encourage?. Bookmark the permalink.